Establishing a broad base of community partnerships has enabled the City of Garfield to begin a Safe Routes to School (SRTS) program that can sustain itself. Although Garfield is comprised of less than 2.2 square miles, it has nine parks, a Boys and Girls Club, a YMCA and two walking paths. Despite such amenities, however, the high concentration of people combined with the lack of busing to schools contributed to significant traffic congestion around the schools. The city’s interest in SRTS programs began in 2005 when local officials became concerned about increasing rates of childhood obesity, says Darleen Reveille of the Garfield Health Department. She created a community task force on childhood obesity, which led to a community initiative called Garfield FUN (Fitness, Unity and Nutrition) fostered by a partnership of the Garfield Health Department and Ramapo College’s nursing program. Its success continues thanks to additional partnerships with the Park and Recreation Department, the Garfield YMCA and the Garfield Boys and Girls Club, Partnership for Community Health, Bike New York and New Jersey DOT. The Health Department used $4,500 from its SRTS non-infrastructure grant to hire a GIS project consultant to implement an interactive community asset and walkability map. Garfield’s Streets Walkability Guide is designed for participants in the Garfield YMCA Before-School Program to help make the walk to school safer and easier. To create the maps, students in the Before-School program were given cameras to document their walks to school, and the information they captured was incorporated into interactive GIS maps that identify crosswalks, street signs, traffic lights and crossing guards, as well as barriers, hazards and street lighting, for example. Students learned first-hand about both SRTS issues and new technology. 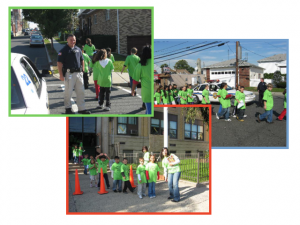 Extracts from SRTS Case Study: Garfield, New Jersey Health Dept. Forges Alliances to Benefit Urban Schoolchildren. Click here to see the full article.